A big chunk of my dad’s time post-retirement has been spent organizing and cataloguing the vast archive of stuff he’s accumulated over the years. In the process of rifling through back issues of The Comic World News, he recently realized that one of his readers and regular interlocutors at the time was none other than George R. R. Martin, author of the A Song of Ice and Fire fantasy novel series, the source material for HBO’s Game of Thrones. My dad hasn’t seen the TV show nor read the books, but he eventually connected the dots from the George R. R. Martin of Bayonne, New Jersey whose letters to the editor appeared in almost every issue of The Comic World News, to the George R. R. Martin who penned the titanic pop-cultural phenomenon that GoT has become. Crazy. 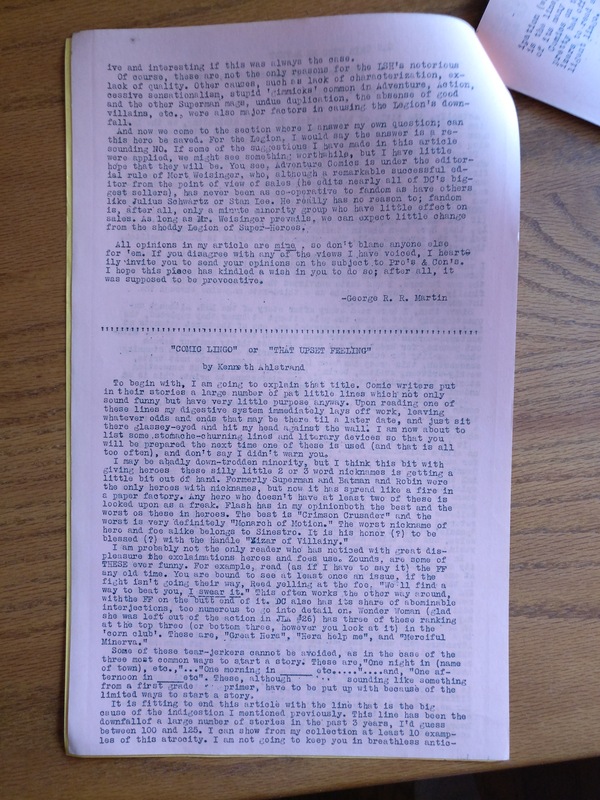 Unsurprisingly, there’s a market for GRRM ephemera, including the pages that my dad mimeographed at his aunt’s house from 1963-64. 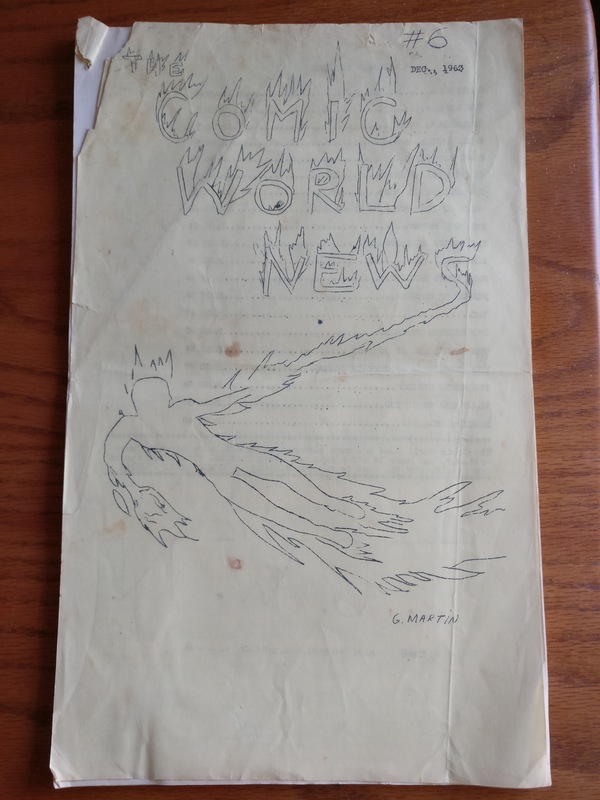 On his fan site, Martin lists all of his contributions to ’60s comics zines, including his appearances in The Comic World News. 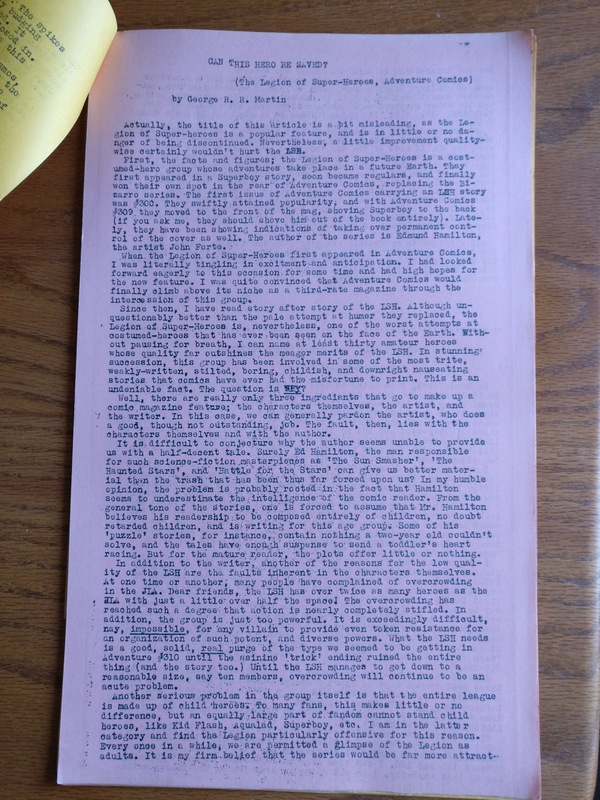 In addition to several “letters of comment” (precocious teen-to-teen commentaries on previous articles published in TCWN), he also had a semi-regular non-fiction column called “Can This Hero Be Saved?”, and even contributed the cover art for The Comic World News #6, published in December 1963.